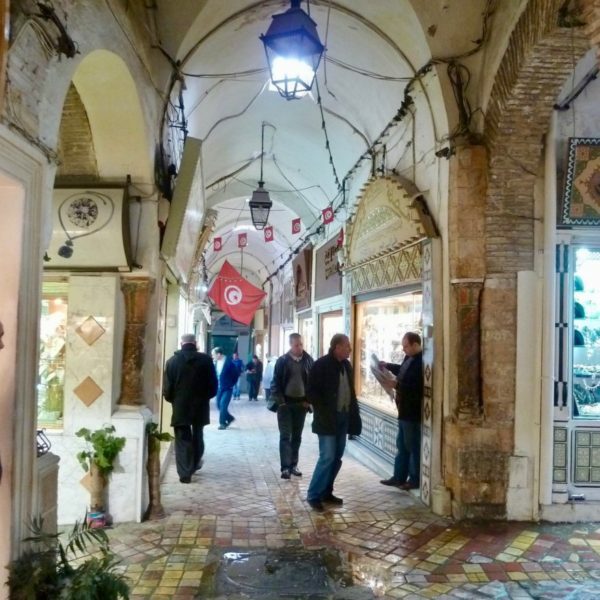 The ruins of ancient Carthage and the lively medina in Tunis are just two of the many reasons to visit Tunisia’s capital city. You should go, but don’t go alone. This is the country that gave birth to the movement known as the Arab Spring in 2010. Political unrest was still simmering when we visited in 2013. Friends in Tunis recommended that we hire a car with a driver, who guided us to the major attractions and looked out for our security. In 2015, two terrorist attacks took a heavy toll on Tunisian tourism. Thirty people — mostly British tourists — were killed in an assault on a beachside resort. 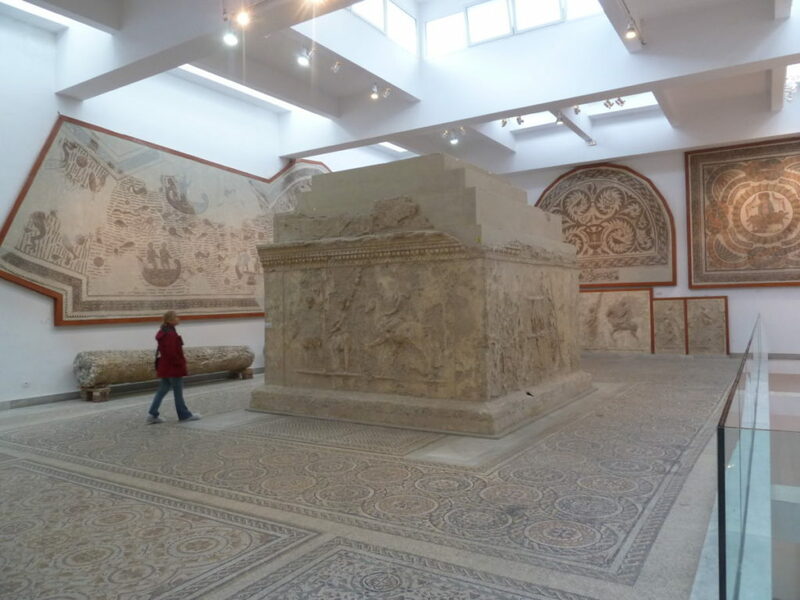 An attack on the popular Bardo Museum in Tunis left 22 people dead, including 20 visitors from Europe. As I write this blog in 2018, Tunisian tourism has not recovered. In fact, no major publisher has put out an updated guide to Tunisia in years. Does this mean you should cross Tunisia off your bucket list? No. The chances of a life-threatening incident are no greater than in Paris, London, Berlin or Barcelona. With awareness of your surroundings and the kindness of strangers, you can experience Tunisia’s treasures in reasonable safety. Watch this video to see the highlights, and then read the rest of this post to get started planning your visit. 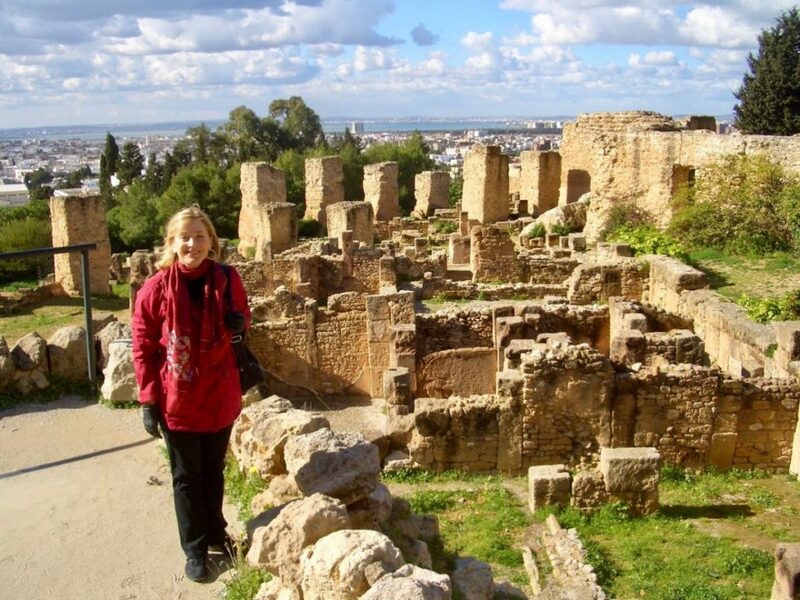 With Tunis as a home base, you can take day trips to the UNESCO World Heritage site at Dougga, the Grand Mosque of Kairouan and the El Jem Coliseum, which rivals the one in Rome. 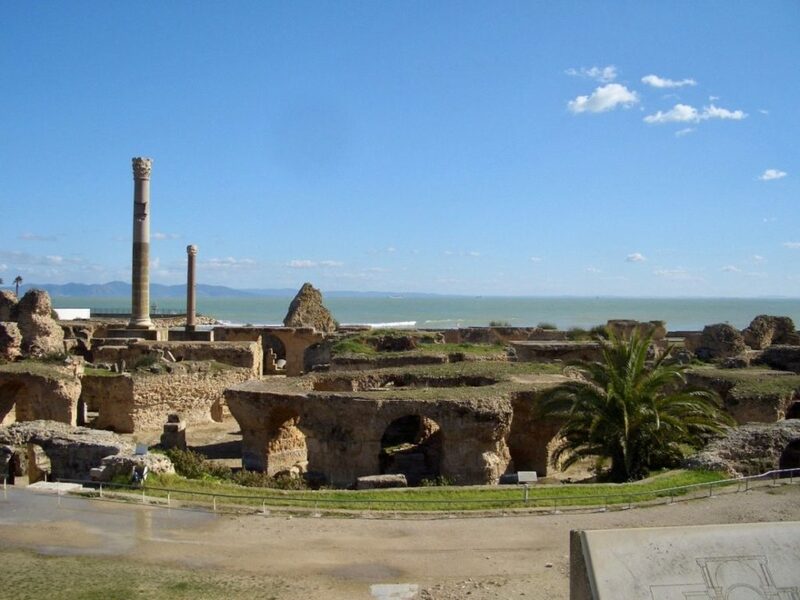 Founded in the 9th Century BC, mighty Carthage was once a sprawling commercial metropolis on the gulf of Tunis. 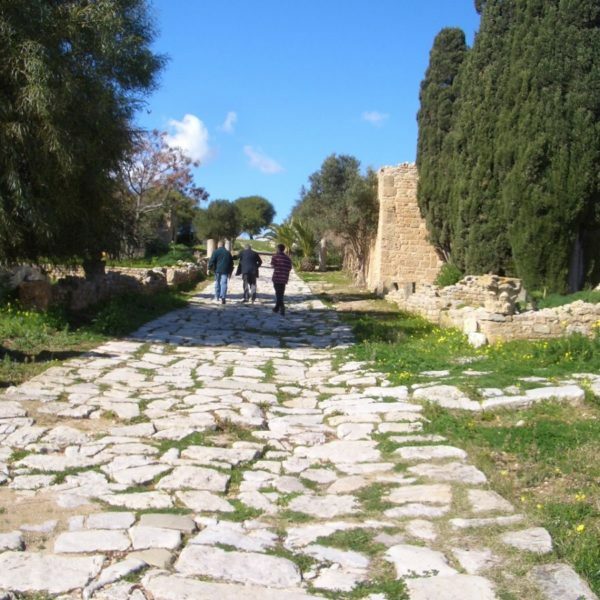 Traces remain of the original Punic port city that was destroyed by the Romans in 146 BC. 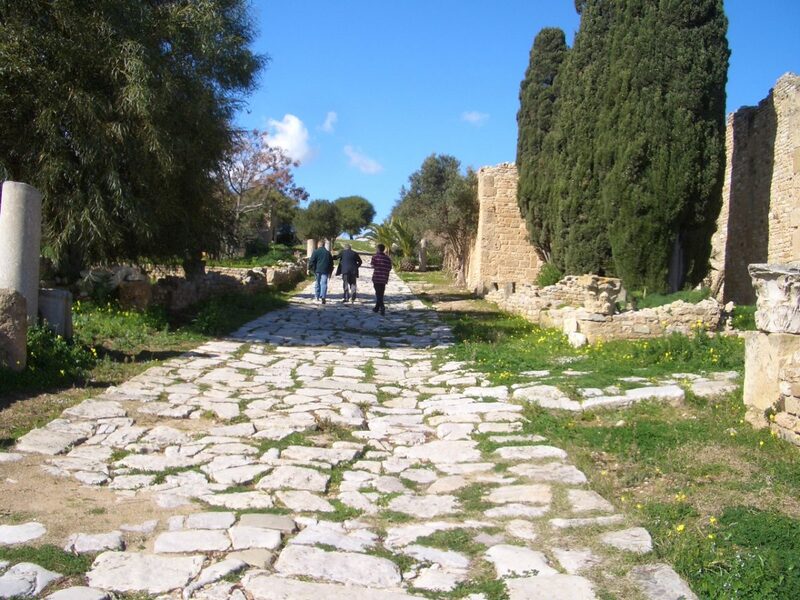 The conquered people of Carthage were enslaved and Rome built a new city over the ruins. 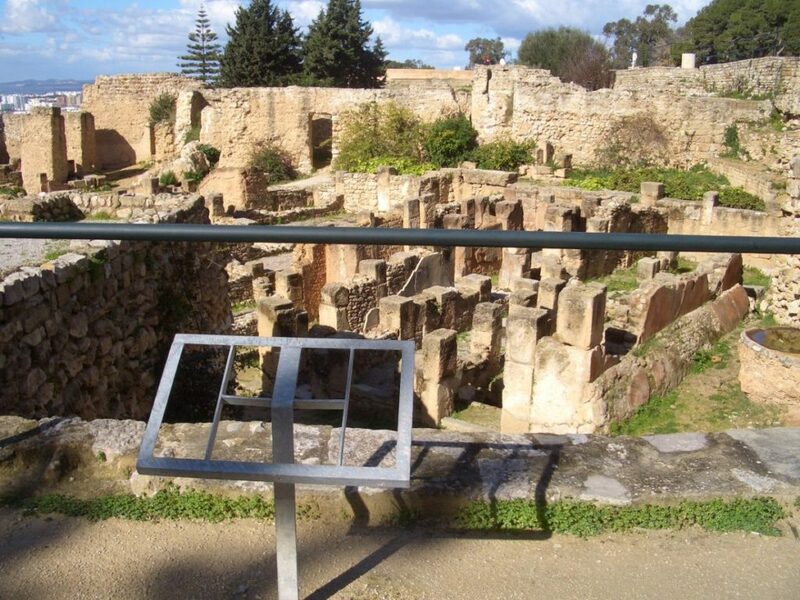 Today, the remains of these ancient civilizations are easily visited on an afternoon in the suburbs of Tunis. Political and economic turmoil has taken its toll on the tourism infrastructure. Once-helpful signs are often missing. Our driver, Ali, expertly navigated through the vast site. Each of the half a dozen stops revealed another layer of history. Although this is UNESCO world heritage, informational signs have fallen victim to neglect or lack of funding. There was a small museum near the St. Louis Cathedral, but the workers seemed more interested in their coffee break than informing a handful of visitors. After Ali gave a basic explanation of each stop in French, we were content to soak up the atmosphere, using our imaginations to fill in the blanks. 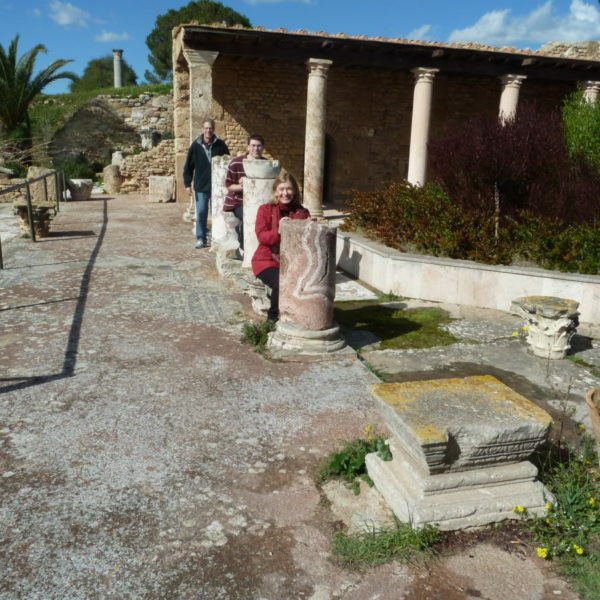 A stranger approached as we entered the ruins of a once-posh Roman villa on a hilltop with a commanding view of the sea. In a halting mix of French and English, he offered to show us around. He waved us into an underground passageway, filled with fragments of Roman mosaics. Each of these pieces might have been a prized museum display somewhere else, but the sheer number of them here meant they were stacked in this makeshift storage area like discards at a yard sale. 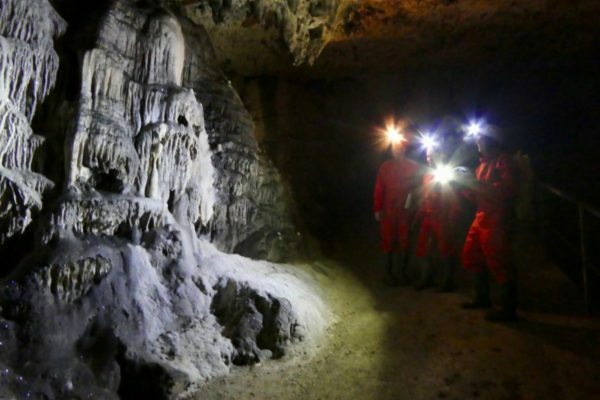 The stranger showed how it was possible to kick the dirt and uncover more mosaics or shards of ancient artifacts. He offered to sell us some coins he said he found, but we had no way of knowing their authenticity, so we instead gave him a small tip for his hospitality. We took only pictures and left everything else in place. 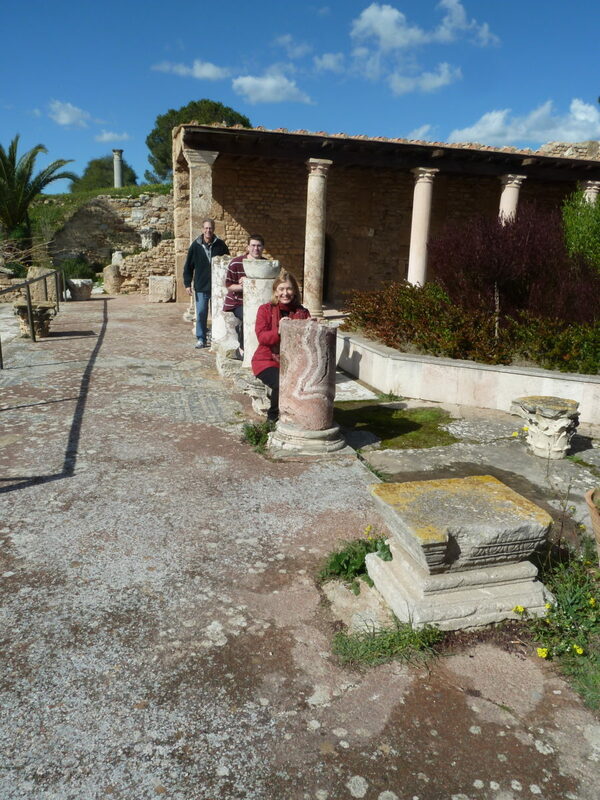 Roman baths with a spectacular sea view in the ruins of Carthage, not far from Tunis. 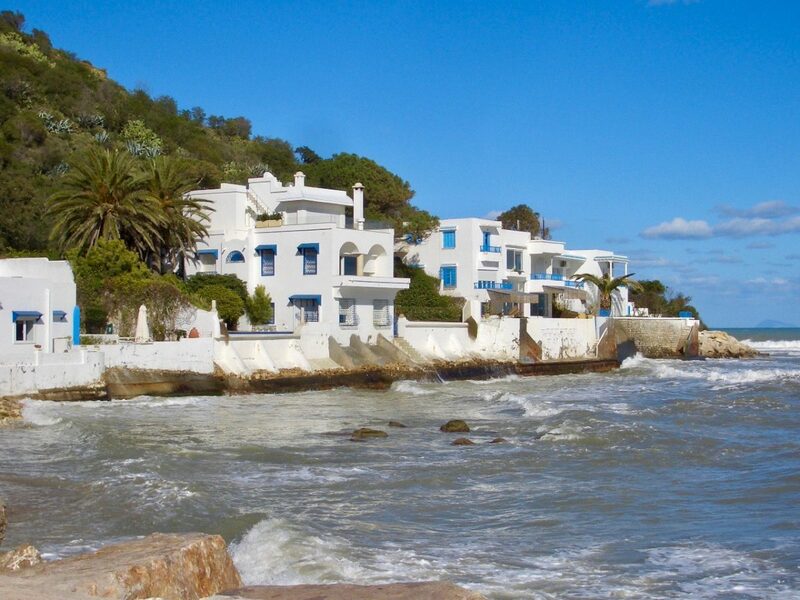 Re-joining our driver Ali, we lingered at the spectacular seaside ruins of the Roman baths, and explored the remains of a Punic religious sanctuary before strolling in the seaside town of Sidi Bou Said, with its charming blue and white villas. 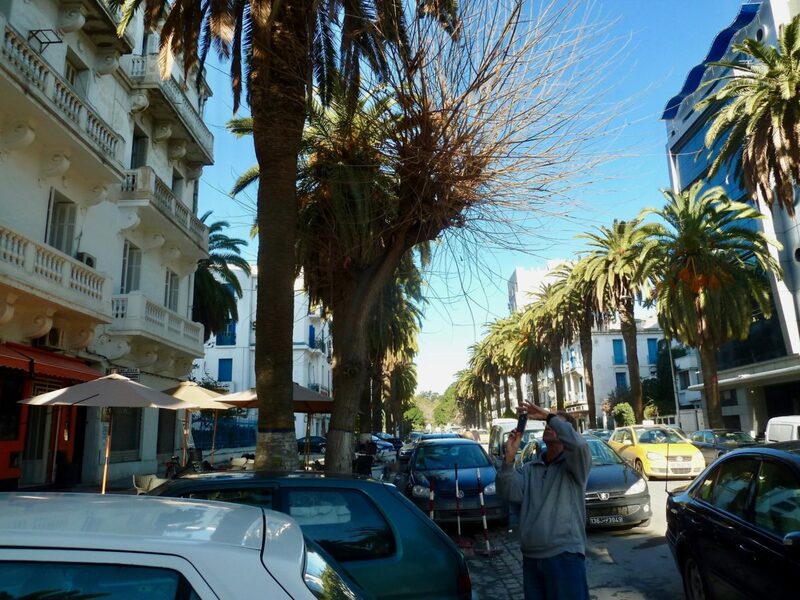 We headed back into the present-day suburbs of Tunis for a bountiful couscous lunch and spent the afternoon exploring the streets of the capital in daylight. The morning of our last day in Tunisia was reserved for the antiquities of the Bardo Museum. 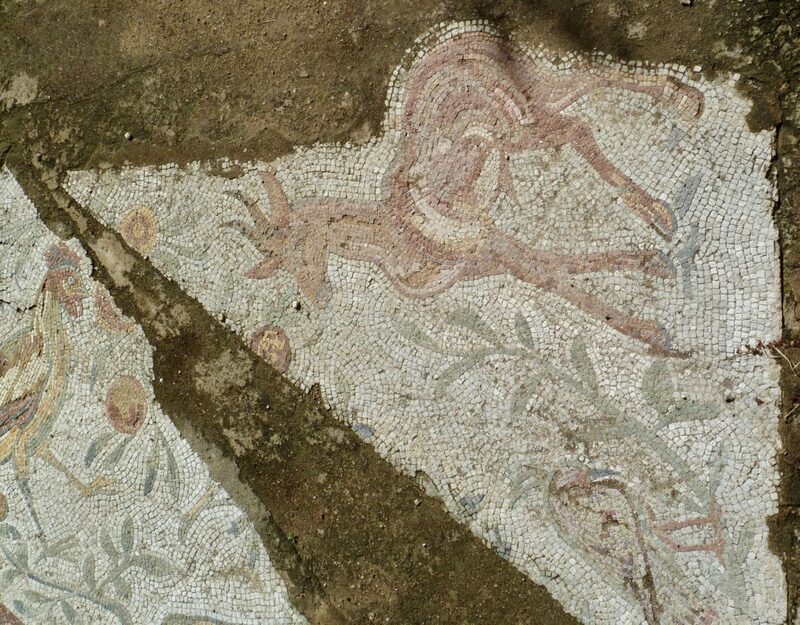 Considering the quality of the discarded mosaics we had seen in Carthage, those selected for display in the museum are truly spectacular. 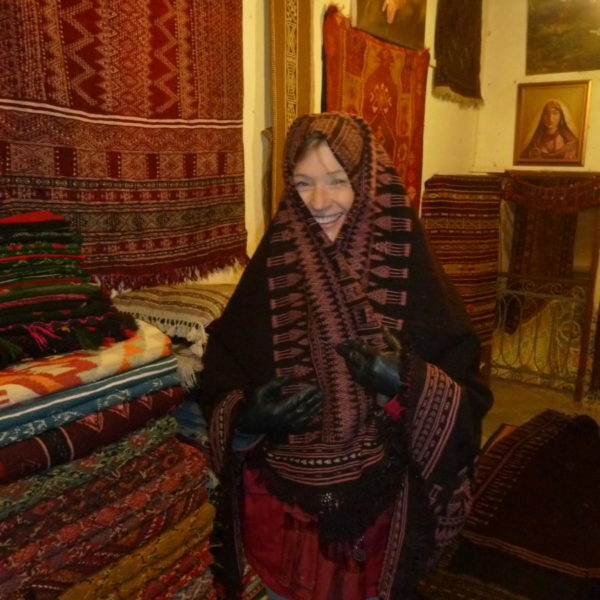 You’ll be asked to put cloth slippers over your shoes to walk on the ancient floors. It is heartbreaking to realize that these artifacts don’t inspire awe in everyone. 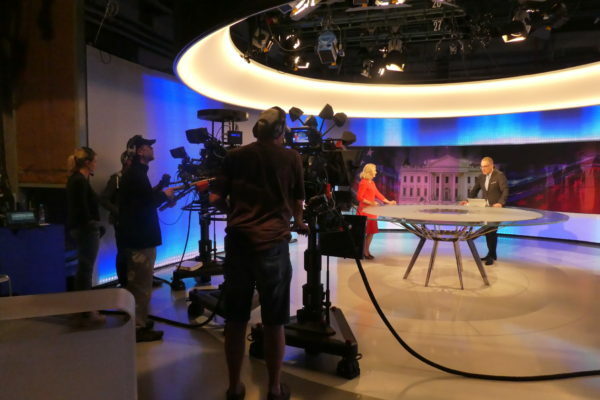 Security is understandably tight, but it wasn’t enough to prevent an extremist attack on visitors in 2015. 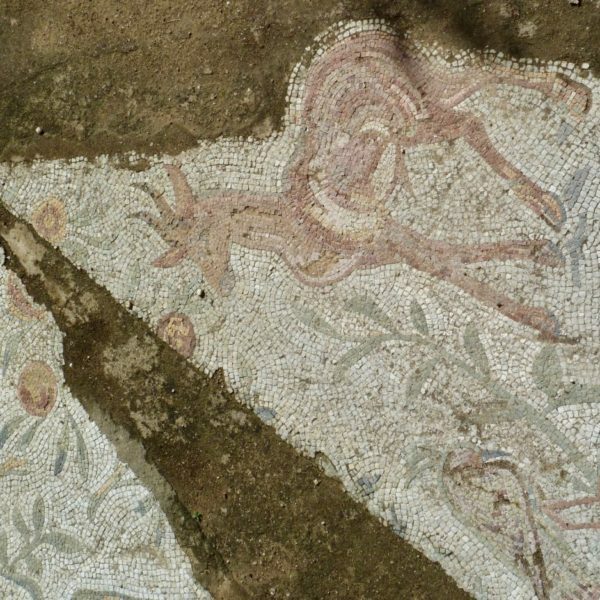 Cover your feet to shuffle through rooms filled with priceless mosaics at the Bardo Museum. 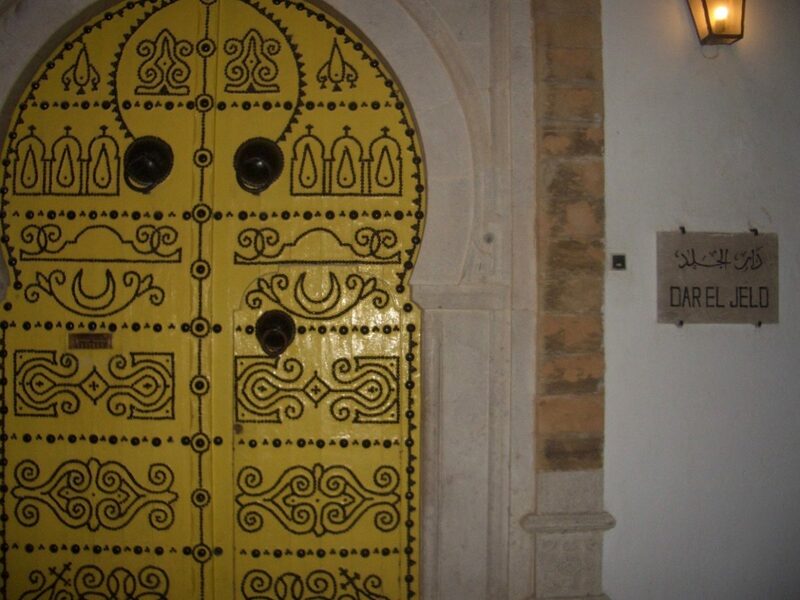 Thanks again to our friends in Tunis, we secured a reservation at one of the city’s top restaurants, Dar El Jeld. 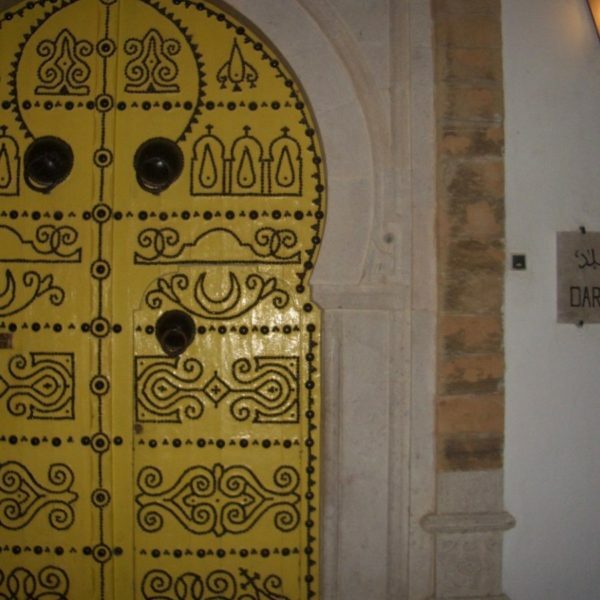 It’s located in an historic palatial home behind a traditional door in the medina. 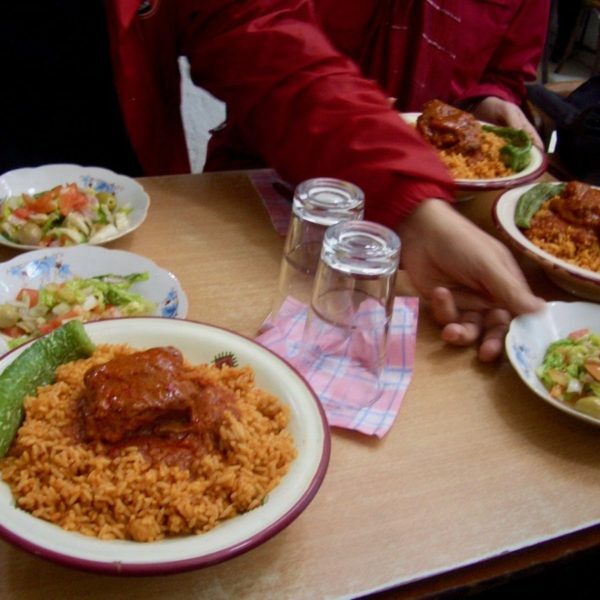 The classic Tunisian dishes are served in an elegant indoor courtyard. On another day in the medina, we sat down for lunch at a more casual restaurant. 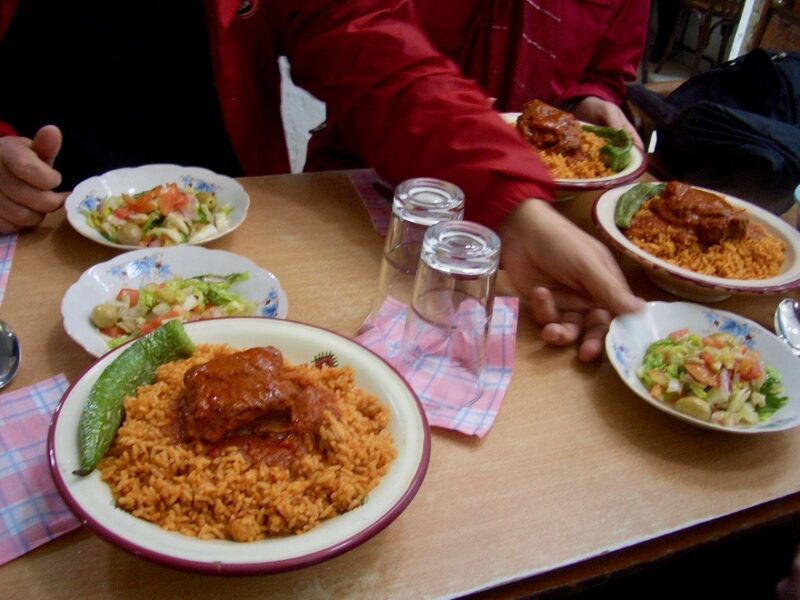 Grilled local fish and vegetarian versions of couscous almost always offer an option for non meat-eaters. Our host pointed out areas of the medina where slaves were once traded, and we visited different stalls to check out everything from traditional headgear to artwork and handcrafts. Our friends recommended the Hotel Belvedere Fourati as a home base. Operated by the Fourati family, the #1 hotel in Tunis on Trip Advisor has a long tradition of hospitality. 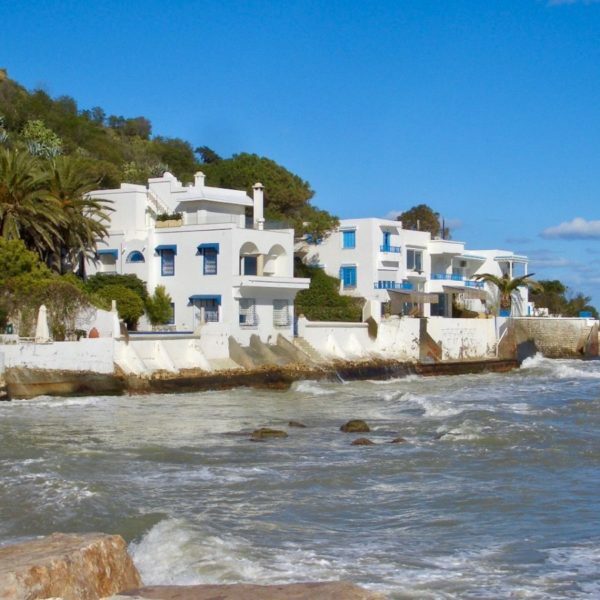 Tunisia also has plenty of beach resorts, but we were visiting in chilly February and more interested in the history and culture. This hotel is not a resort. It was recommended by our friends in Tunis, and it’s a popular gathering spot for local meetings as well as business travelers. The waiters kept our coffee cups full at breakfast, which offered croissants comparable to what you might find in Paris. While the streets are bustling during the day, the neighborhood is a scary ghost town at night. The hotel was an oasis from the crazy traffic and trash in the streets. 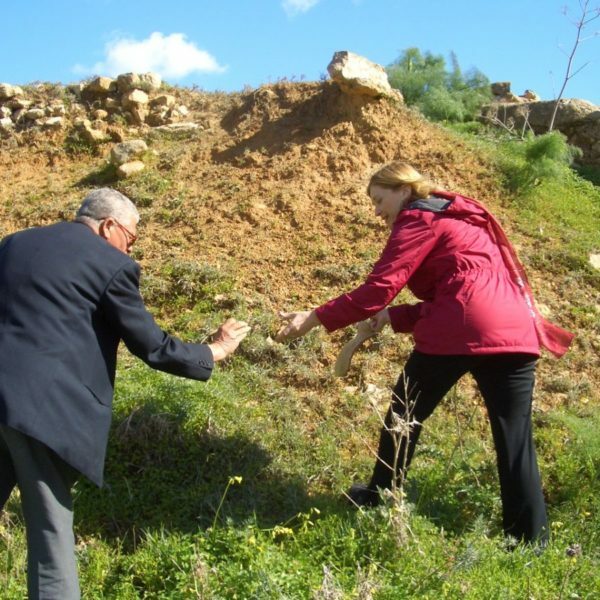 Transportation: You should hire a car and driver from the nearby Ulysee Rent a Car agency for seeing the sights of Carthage, the medina, and day trips to Dougga and El Jem. Our host family made sure we didn’t encounter any difficulties from `’the transition`’ as they call it. 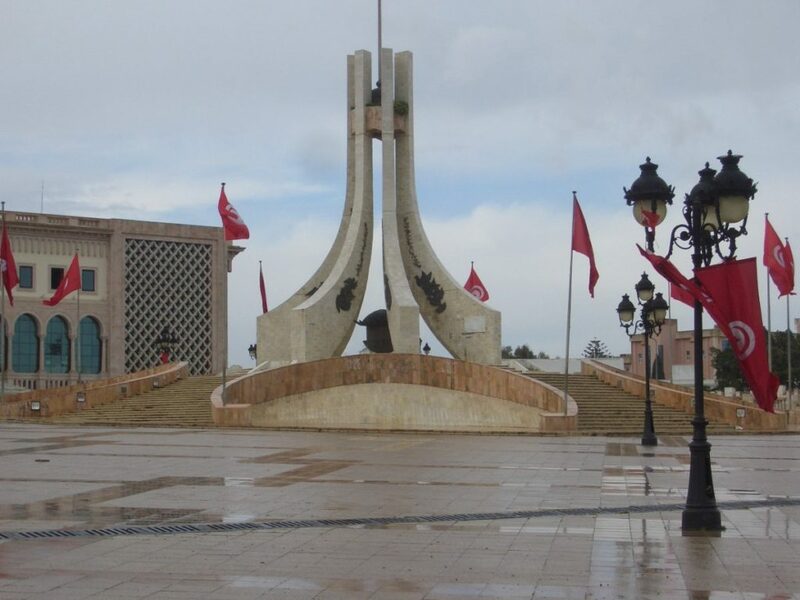 Language: Tunisia was a French colony from 1881 until gaining independence in 1956. If you don’t speak Arabic, you’ll be better off if you understand and speak some French. While well-educated upperclass residents of Tunis may also speak some English, you’ll need Arabic in the countryside. Another reason I highly recommend hiring a car and driver. Our guide Ali spoke little English but cheerfully put up with my rusty college-level French. 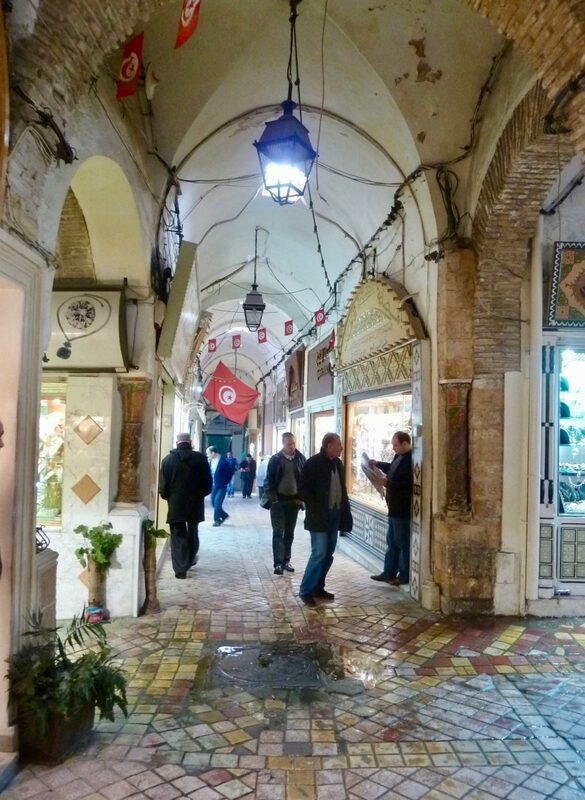 Money: The currency is the Tunisian Dinar (TND), worth about 35 cents to one US dollar when I wrote this blog in 2018. Everything from meals to hotel rooms was so reasonably priced that it offset the cost of the private car hire. Value of traveling safely in a small family group — without the unwanted attention of being in a large tour bus — priceless! Getting There and Away: We flew Air Tunis from Rome, arriving after midnight on a delayed flight, and took a taxi to our hotel. Leaving the port of Tunis by ferry to Sicily, we reserved a sleeping cabin on what turned out to be a tattered cruise ship with an empty swimming pool and stripped-down restaurants that had seen better days. Most of the passengers were migrant workers who slept on the floors wherever they could find a space. Day Trips from Tunis: There’s a lot more to see outside the capital. 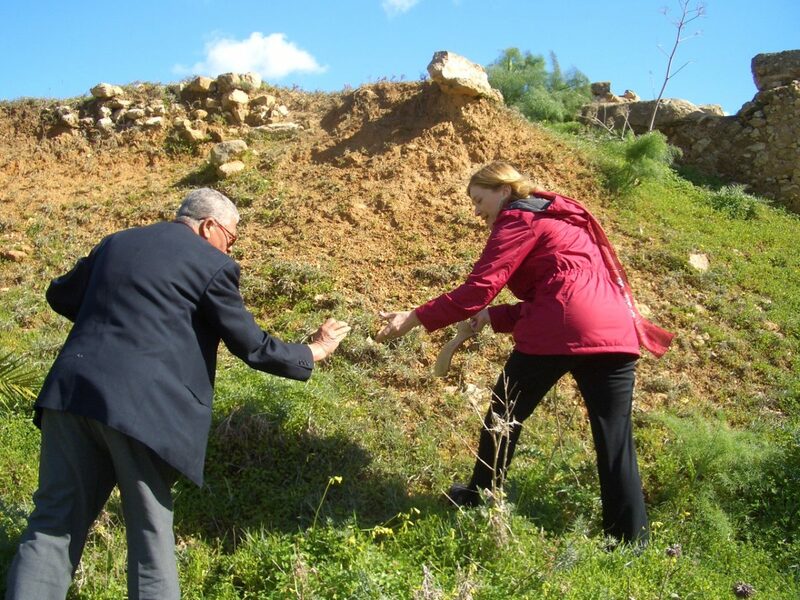 Click here to read about a Berber village, the sprawling ancient city of Dougga and the underground villas at Bulla Regia. Coming soon: a post that describes another day trip to the Grand Mosque at Kairouan and the El Jem Coliseum. Outside the medina, we didn’t linger in Kasbah Square because of protestors and troops gathering nearby. 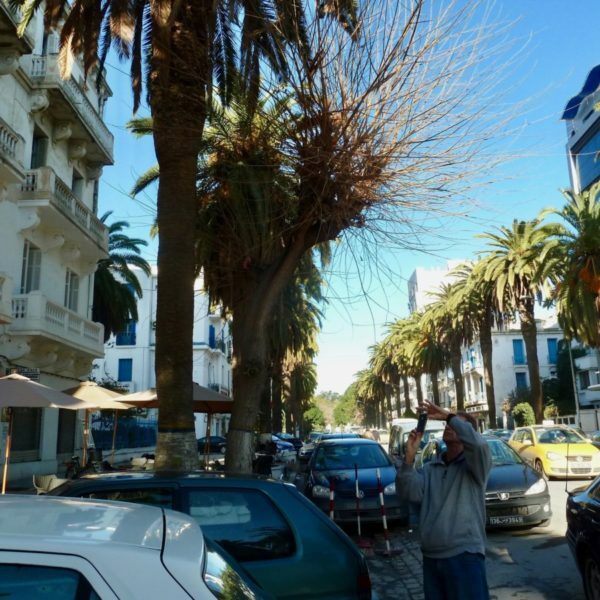 Stranger Danger: Our fun day in the Tunis medina was cut short because of plans for a political demonstration. As crowds and military presence began to build, our hosts recommended that we head for the port to board our departing ship earlier than we had planned. Always, always heed warnings from the locals and stay on top of travel alerts from the US State Department, which advises travelers to avoid large gatherings of any kind. Want more tips on how to safely visit the world’s great destinations? 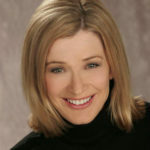 Like @strangersinthelivingroom on Facebook, and sign up for the occasional email when there is a new post. 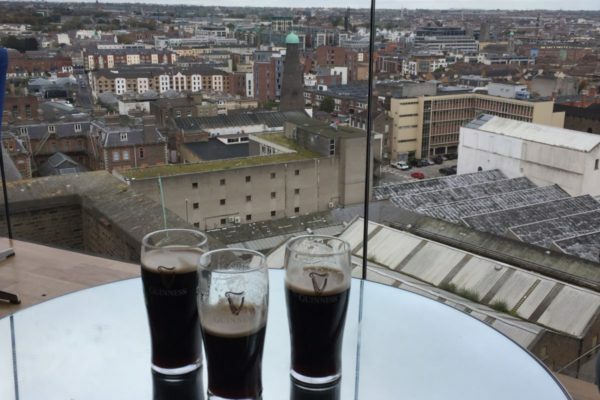 Thank you for reserving your hotel through the Trip Advisor links in this post, which will support my journalism with a small commission at no extra cost to you. 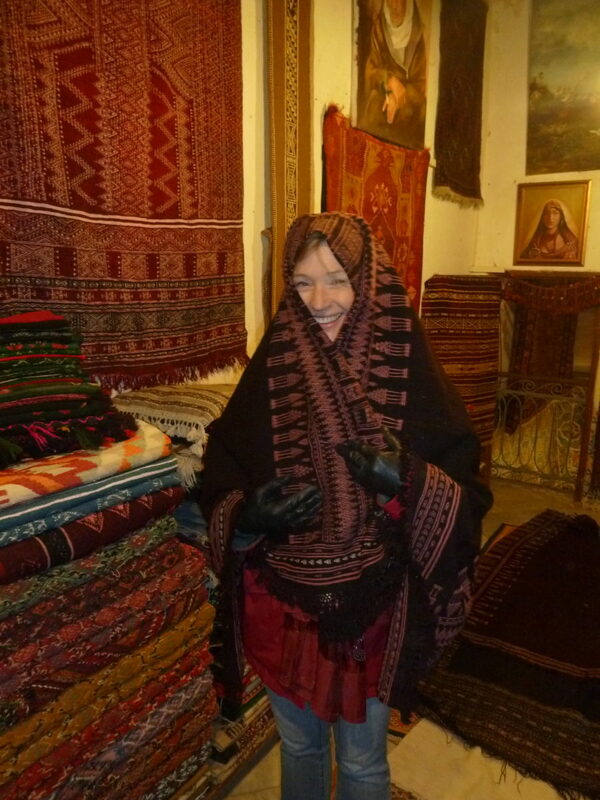 And see more trip ideas @strangersblog on Trip Advisor, where more than 300,000 people have read my reviews.